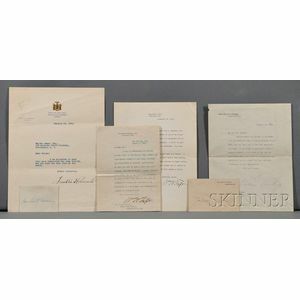 Presidential Autographs, Four Signed Letters, Two Signature Cards: William Howard Taft (1857-1930) two typed letters signed, 1908 and 1913; Calvin Coolidge (1872-1933) typed letter signed on White House stationery as President, 1923, and signature on White House card, 2 3/4 x 4 1/4 in. ; Herbert Hoover (1874-1964) signed card, 2 1/4 x 3 in. ; Franklin Delano Roosevelt (1882-1945) typed letter signed as Governor of New York, 1932; and Charles Francis Adams Jr. (1835-1915) autograph letter signed, 1891.